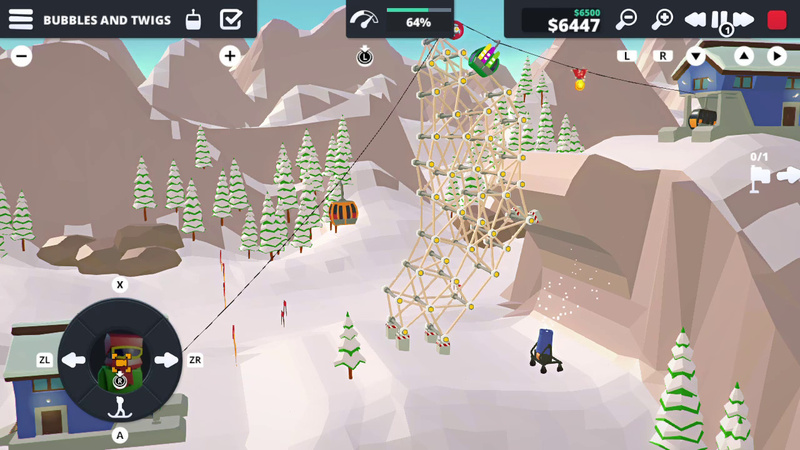 Known as Carried Away in its early access PC guise, Hugecalf Studios’ renamed When Ski Lifts Go Wrong is a node-based physics puzzler that has you constructing chairlifts over terrain to get riders to a finish line in one piece. Questionable construction will cause your passengers to collide with obstacles or succumb to gravity, perishing like little ragdoll lemmings. There are prominent shades of Bridge Constructor here, but When Ski Lifts Go Wrong does just enough to build an identity of its own that wins you over, despite its slightly generic façade. Each stage begins with a low-poly landscape over a graph paper background. 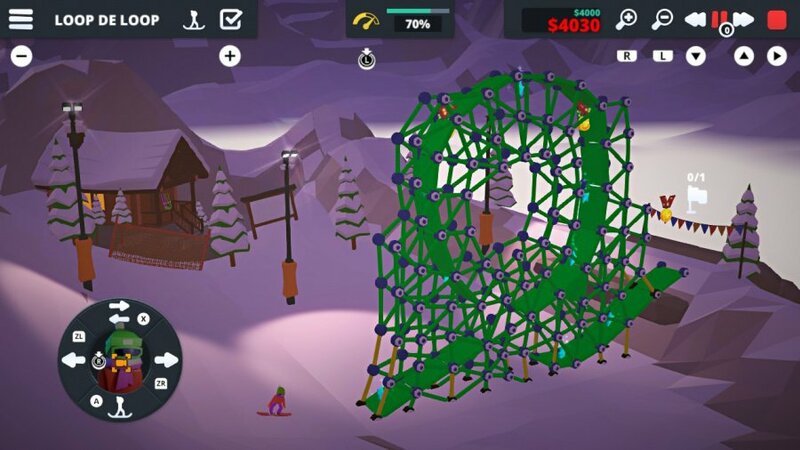 This snap grid can be toggled off, but it comes in useful when you're building sturdy structures to carry riders safely via chairlift, gondola or simple drag lift to a finish line. Riders can easily fall off cliffs or snag on trees and other impediments and you must consider the variety of forces acting on your ski lift. In addition to the main cable, building materials include planks of wood, stronger logs, guy ropes, pulleys, platforms and scaffolding. Each component carries a price which is totted up in the top right corner of the screen and you’re free to spend as much as you like, although coming in under budget is a bonus objective. Other goals include making a structure that doesn’t crumble the moment you’ve crossed it and collecting floating medals on every stage. While the primary goal is getting your rider(s) to the finish line come hell or high water, trophies are awarded for nailing all the bonuses and we found ourselves retrying again and again until we’d tweaked our structure just so to get top marks before moving on. The most enjoyable part arguably comes not from construction, but on the stages where you take direct control of the skier/snowboarder. On these courses building the lift is only half the job; you must also get your rider through it with Excitebike-style precision, controlling their angle and jumps. When you’re ready, hitting the right D-button starts the simulation and on the appropriate stages you get limited control (holding ‘A’ puts you into a crouch to build up speed and releasing makes you jump). Vehicles – including snowmobiles, bicycles and motorbikes – provide more variety, and while the floaty physics aren’t as sophisticated as something like Trials, they’re consistent enough to be fun, even when the lattice beneath your meticulously erected ramp crumples under your weight and you faceplant into a ravine. ‘Gore’ can be turned down on a menu slider, although it’s never more than a little blood stain left on the snow. Vitally for a game of this type, its physics feel fair; the tension of the cable or a rider’s grip on a button lift feels just right. Clicking the left stick colour codes every part of your construction according to forces acting on it, going from green to yellow to red in real time. An overall percentage bar indicates the stress being applied to the entire structure and hitting 100 percent results in collapse. It’s a solid system which enables you to find and quickly rectify design flaws. Controls are well implemented on Switch, too. Every button is used and they take a while to sink in, but the tutorial does a decent job acquainting you with everything you need. It’s playable via touchscreen, although the stages requiring direct control of the riders are easier with button input, so you’ll still want to play with Joy-Con attached – we preferred to use them for everything. While slowing down the simulation to help identify problem areas is possible, the lack of fast forward is a little frustrating, especially in the longer later levels. You’re forced to watch the whole simulation play out, even if only the final part needs finessing. The ‘muzak’ that accompanies your construction doesn’t have the charm to match the mechanics either, making this a perfect game to play with a podcast on in the background. There are eight different mountains to conquer, each with thirteen levels to complete, and many of them will keep you absorbed for a long time as you chase the trophies. 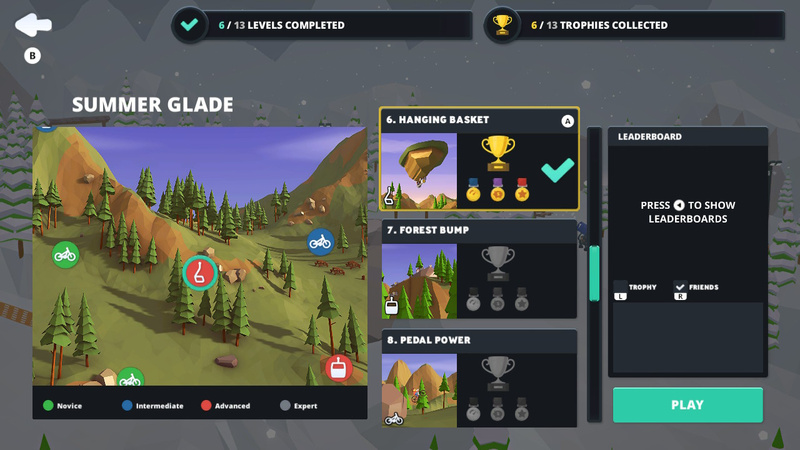 Beyond the main game, Sandbox mode enables you to create your own levels, manipulating everything from the base terrain to individual riders, elements and restrictions. We created some ambitious designs but, unfortunately, they can only be shared with our nearest and dearest – online functionality is limited to leaderboards and whatever you grab with Switch’s Capture button. The editing tools work nicely, so it’s a shame you can’t share your creativity beyond whoever’s sitting next to you. 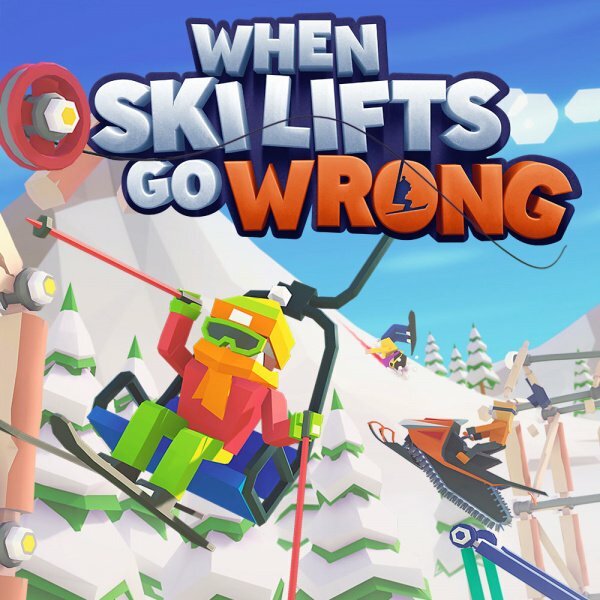 Despite the logo giving the impression of a garish knock-off or mobile port, When Ski Lifts Go Wrong delivers some captivating simulation puzzling, with a light dusting of Excitebike helping to set it apart from the crowd. The UI and controls work very well on Switch and, although not being able to share or sample others’ creations online is disappointing, the base game works beautifully to provide a very enjoyable package if you’re after some rock solid, physics-based fun. I've never tried a game like this. It looks fun, but it also looks like it would take a lot of time to construct the bridge. And thank you Mr. Lane for noting the lack of cool music and the use of touchscreen. With the 'excitebike' extra, this may be a discount purchase. You have used the “snow joke” pun for like 3 different reviews now. might be time to bury it under the snow bank. Poly Bridge is still the biggest game of this type on Switch. 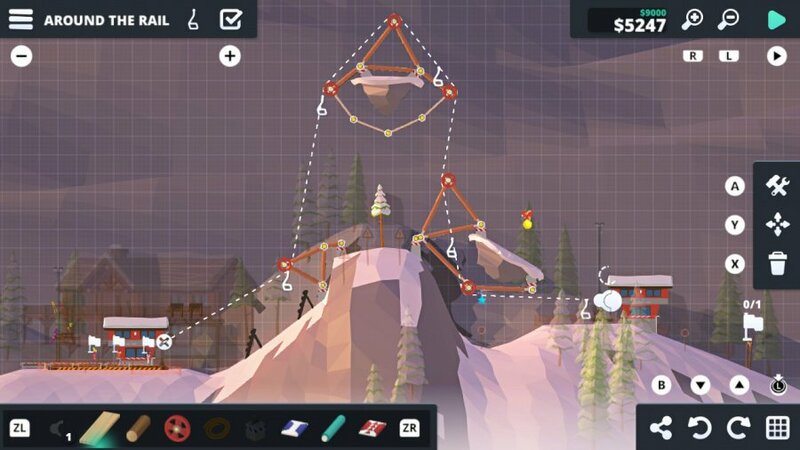 Poly Bridge could be big in the Switch, but I'm still waiting for the video recording function, after all, the gifs at r/polybridge sold me on the game. When ski lifts go wrong? Is this guy in the game? Aaaaaand another 8/10. This gets ridiculous. This is one of those games when it was announced I had zero interest in, however seeing several reviews over the past week has made me very interested. I will keep an eye out for a future sale and might take the plunge in the future. It's a fun game. I've put a few hours into it and still have a long way to go, especially if I want to earn trophies on every level.